Don't have a TopTravelFoods account? With nine branches in Bangkok, Kub Kao'Kub Pla is a successful restaurant chain serving authentic Thai home recipes since 2008. It has all the modern looks, is always nicely clean and has an extensive mid-range priced menu which is perfect to explore the Thai cuisine. Reason enough to write an article Kub Kao'Kub Pla. Recently, I’ve visited two branches: at Marketplace Thonglor and at La Villa Aree. As always, the restaurants were packed with Thai and the restaurants were clean and beautifully decorated. The service is prompt and because of all this, it is such a popular restaurant. It’s just a perfect place to take your family and friends out for dinner. One of the highlights of the menu is the Pig Knuckle Stew (265 THB). The pork is so incredibly tender, that it is almost like butter. 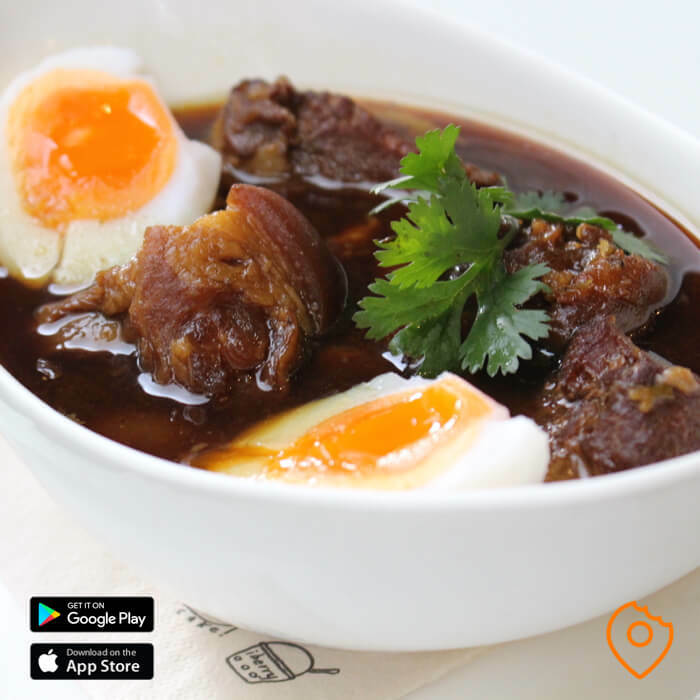 The pork itself is stewed in sweet broth and is served with medium cooked eggs. This is a must-order when you visit Kub Kao'KubPla. Another highlight of the menu is the Crab Meat Curry (380 THB). 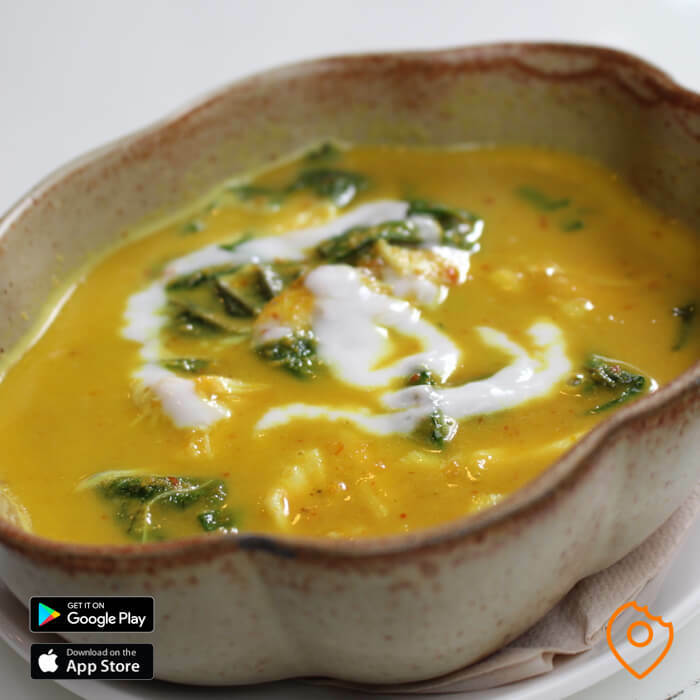 The typical yellow curry is nicely creamy and the crab meat chunks are pretty large. The curry itself is finished with Thai basil and served with rice. Another must-order! The biggest surprise was the Deep-Fried Baby Freshwater Prawns (195 THB). The deep-fried prawns are incredibly crunchy and taste like highly flavoured crackers. 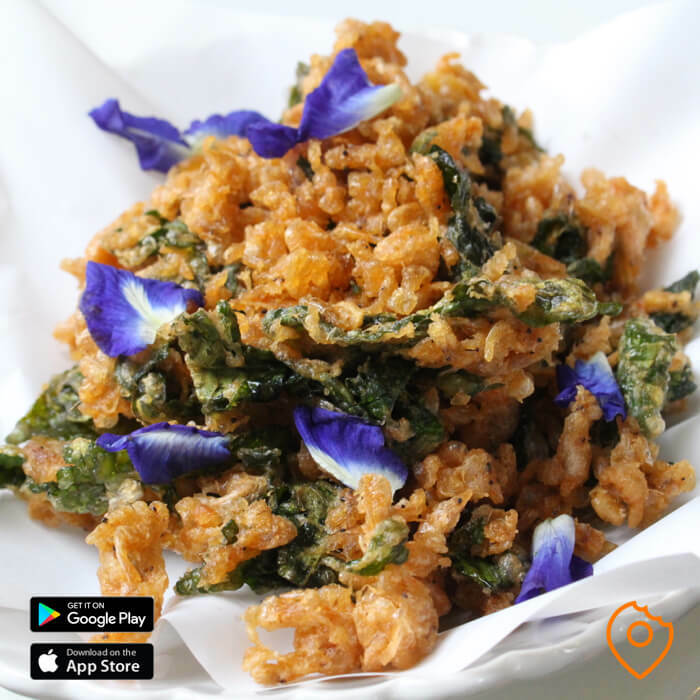 This tasty side dish is served with edible flowers and is highly recommended! Now, so far all the food I tried was seriously delicious. The next dish I tried is a bit different. 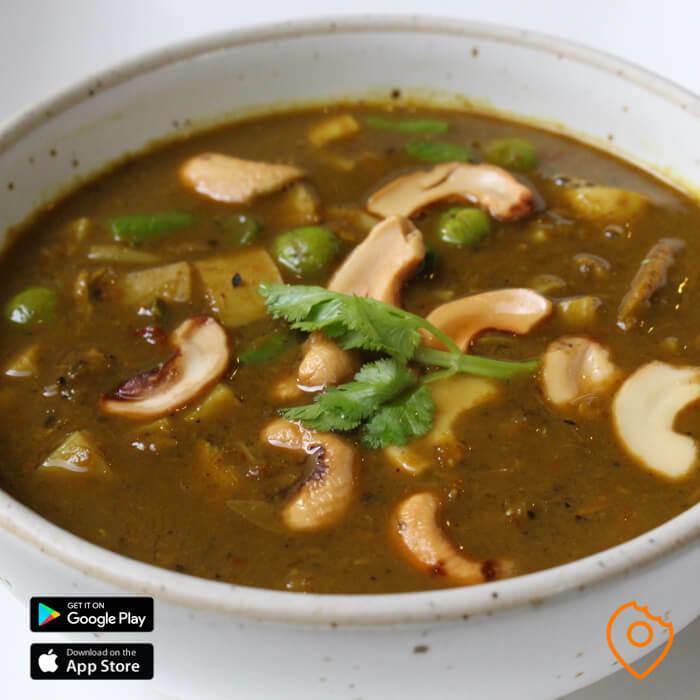 Like the Isaan Cuisine has Som Tam with fermented fish, the Southern Thai cuisine has Kaeng Tai Pla: a Southern Thai Style Spicy Soup with Fermented Fish (195 THB). The soup is really spicy and has that distinguished fish flavour that not everyone likes (similar to the Som Tam Pla Ra). 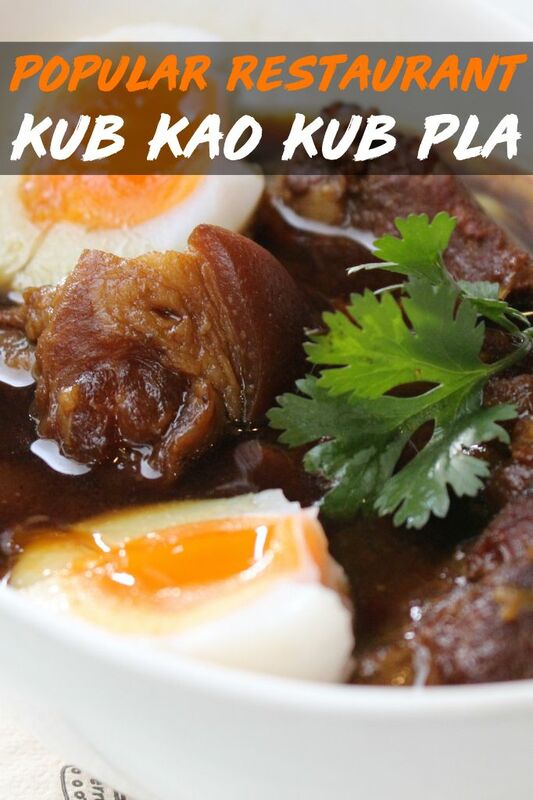 But if you do like the Pla Ra, the soup they serve at Kub Kao'KubPla is most definitely tasty! Kub Kao'Kub Pla is part of iBerry, the well-known company serving delicious ice cream. At some branches of Kub Kao'Kub Pla, including the branch at Marketplace Thonglor, you can find an iBerry store as well. I would highly recommend trying one of their delicious scoops of ice cream as dessert. Overall verdict: Kub Kao'Kub Pla is a popular place to have a great and affordable dinner with excellent Thai specialities. The restaurants look great, have great service and the menu is large, so there is a taste for everyone. Have you visited Kub Kao'Kub Pla and foods we've recommended? Let us know what you think by reviewing the dishes in our TopTravelFoods app. Did you like what you read? Pin it for later! You have rated the article. TopTravelFoods is coming to your city soon. Subscribe now, or follow us on social media. Eat Like a Local, Sign Up Now!